Do Snakes Eat Their Own Eggs? Many animals are renowned for eating their young. People’s first exposure to that is if they have a hamster or guinea pig, which are well-known for eating their babies if you don’t separate them. Does this happen with corn snakes, ball pythons, and other pet snakes? Do snakes eat their own eggs? No, that would harm her chances of her genetics passing on. While clutches are big, they aren’t large enough to justify that. But if one of the eggs is non-viable, then the snake may eat the egg or just the yolk. This is a way of the mother regaining the nutrients that they ‘spent’ to create the egg. Even so, you’ll want to keep the young separate from their mother after they hatch. Snakes don’t have a maternal instinct like mammals do, and wouldn’t understand how to care for their young. 1 Will a Snake Eat Her Own Eggs? 1.1 Do Snakes Eat Eggs? 1.2 Do Snakes Eat Other Snakes? 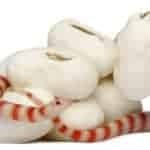 1.3 What Predators Eat Snake Eggs? 2 Do Snakes Look After Their Young? 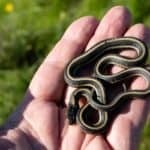 2.1 Why Don’t Snakes Look After Their Young? 2.2 Do Captive Snakes Eat Their Young? Will a Snake Eat Her Own Eggs? As a rule, snakes don’t eat their own young. That’s because the majority of snakes don’t stick around to wait for their eggs to hatch. Instead, they’ll lay their eggs in a safe place before leaving them for good. The eggs are hidden well enough from predators, so they won’t all be eaten. When they hatch, the snakes are ready to hunt and fight off predators by themselves. However, there are certain circumstances where the mother might eat one or two of her eggs. In a normal clutch of eggs, most will be viable, i.e., capable of producing a healthy baby snake. But others will be laid with cracks, which means they could never successfully hatch. If the mother snake notices an egg like this, she may choose to eat some or all of the yolk inside. This isn’t done because she doesn’t value her clutch. It’s a cost/benefit analysis. Since it’s highly likely the egg won’t hatch, that yolk would go to waste. And, since the mother hasn’t been able to hunt and is very hungry, she may as well eat it rather than leaving it to rot. She may either choose to eat the yolk bit by bit, the same way as she would drink water, or she might eat the egg whole. Either way, she’ll eat just that one egg, or however many weren’t viable. She’ll leave the rest of them as they were, in the hopes that they’ll hatch in a couple months’ time. The question remains, though, why she can’t just eat one or two of her big clutch of eggs to replenish herself a little. And speaking more generally, are there snake species that eat eggs? Many snakes eat eggs. 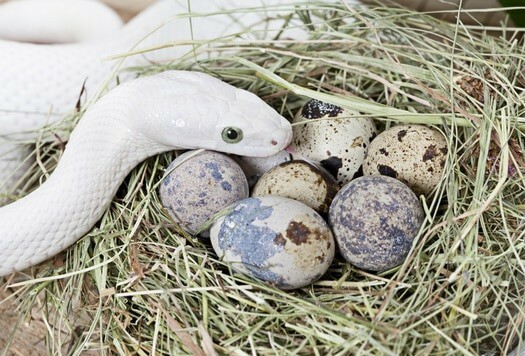 Some survive on nothing but eggs (egg-eating snakes), although these are typically birds’ eggs. Other snakes eat just a few eggs, almost like eating a snack. The problem for most snakes is that eggs are difficult to fit in their mouths, because their fangs or teeth are in the way. Egg-eating snakes have evolved an adaptation to help them eat eggs. According to the Journal of Zoology, they have far fewer and smaller teeth than other snakes, because they would get in the way. Instead, they have rib-like spurs attached to their spine. When they swallow an egg, they’ll use these spurs to crack it inside themselves so they can eat the yolk inside. Because they don’t have fangs or teeth, they actually can’t eat anything but eggs. But egg-eating snakes don’t eat their eggs. They eat birds’ eggs and lizards’ eggs instead. The fresher the eggs are, the better. They’re able to tell how long ago an egg was laid, so that they can catch them when they’re the most nutritious. Do Snakes Eat Other Snakes? There’s more precedent for the idea that snakes may eat their own young. Many snake species, like king snakes, will eat other snakes as the central part of their diet. King cobras, too, will eat other snakes. They won’t eat snakes of the same species, but it can and does happen, if less frequently. This is one of the ways that a snake might eat their own young. It could be completely by accident. Take a kingsnake that lays their eggs and leaves them, as kingsnakes do. A year later, the mother might come across one of her hatched young. She doesn’t have any way to tell that they’re her offspring, so if she’s hungry, she might eat them. What Predators Eat Snake Eggs? Even though snakes don’t eat their own eggs, that doesn’t mean they don’t make a nutritious snack. Like all eggs, they’re filled with yolk, which is like a miniature food store filled with proteins, carbohydrates, minerals and more. This tiny food store is what the developing snake feeds on just before leaving the egg, to help them grow longer and last until they can eat their first meal. Because they’re packed full of nutrients, plenty of animals will eat snake eggs, if they can find them. It’s usually relatively small mammals that will creep in, pick up one of the eggs, and run away as fast as they can. It’s animals like these that some snakes protect their eggs against. Do Snakes Look After Their Young? The majority of snake species don’t even look after their young anyway. But there are a few snake species that do. Ball pythons are one of the very few that stay with their eggs all the way until they hatch. The mother will sit on top of her clutch, almost like a bird protecting her nest. When the snakes’ hatch, she’ll even look after them for a few days before moving on. But that’s the most that she’ll do. No snake looks after their young long-term, like mammals do. The mother gets on with life, either mating again if there’s enough time before the end of the warm season, or overeating to prepare for winter. But ball pythons are the exception to the rule. The majority of snake species don’t hang around, and as such, don’t eat either their eggs or their young. 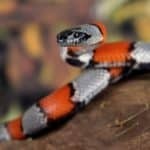 Why Don’t Snakes Look After Their Young? It’s for the sake of the mother’s health. Snakes tend to mate in the spring, immediately after brumation. 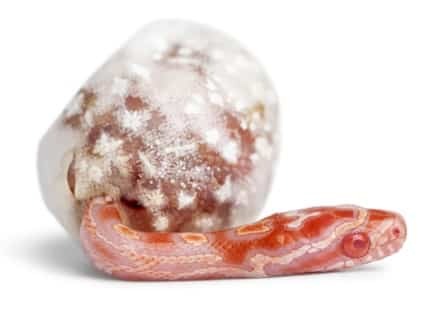 Brumation is like hibernation, a period during which snakes can’t eat because it’s too cold for them to digest. When they emerge from brumation, they find some food and find other snakes to mate with. Once the female is gravid (‘pregnant’ with eggs), she finds it more difficult to hunt and escape predators. So she’ll spend much of her time hiding, just like she did when she was brumating. And over this period, she’ll use up much of her fat reserves to create the eggs the yolks inside them. This takes it out of her, which is why snakes that have just laid eggs are so thin compared to normal. At this point, the female will be close to starvation. She has to get out as soon as she can and find something to eat. But she isn’t just peckish. She has to consistently eat much more food than she usually would to build herself up again, since fall will be coming up, and cold temperatures with it. If she were to sit with her eggs to protect them, she couldn’t do that. Do Captive Snakes Eat Their Young? A captive snake won’t eat their own young if they’re housed with it. But that doesn’t mean that putting them all in the same enclosure is a good idea. If your snake lays eggs in captivity, you can choose to leave them in there with her. However, the best practice is to take them into an egg box, and put them in an incubator. Once they hatch after two months or so, you then have to house the snakes somewhere. Housing them with their mother would be a mistake. Snakes aren’t social creatures, and they aren’t natural parents either. Leaving a baby snake with their mother (or father) won’t cause any parental instinct to kick in. Instead, the parent will get stressed out, because snakes much prefer being alone. If anything, they might see their young as a threat. While they’re unlikely to eat their own young, cannibalism among snakes housed together is semi-frequent. It occurs when one snake is significantly smaller than the other one. And of course, it usually happens in species that often eat other snakes, like king snakes. So, instead of housing them together, put the young in a series of small plastic tubs that are set up for them to live in. 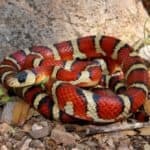 When Do Milk Snakes Lay Eggs? 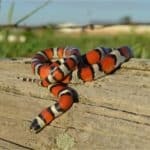 What Do Milk Snakes Eat in Captivity and the Wild?